First night payment will be charged to your credit card, and will be retained if you cancel. Balance due will be charged to your card 30 days before check-in, and will be retained if you cancel, or shorten your stay, or don't show up by 9:00 am the following day without notice to us. 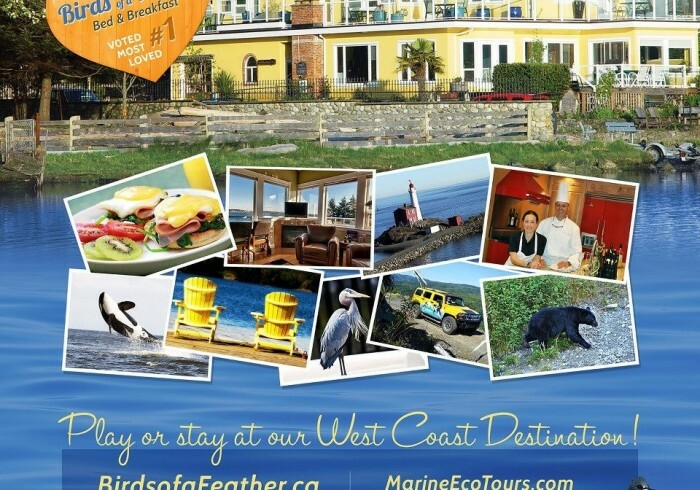 Rates are based on 1 nights accommodation for 1 or 2 people (add $35.00 per extra person in same room) and always include a full course hot breakfast, complimentary use of our private dock, canoe, kayaks, and bicycles. Wi-fi, parking, Netflix, & hot tub are also all included. Weekly, discounted, off-season (November 01 to March 31), holiday and packaged (i.e. weddings, private boat charters & scattering ashes) bookings, and booking all rooms are all fully prepaid and non-refundable. Payment will be retained if you cancel. Reservations priced on a fully prepaid, no cancellation basis are not refundable under any circumstances. 25% Deposit Required. Balance due at time of tour. 48 hour cancellation. If you do not cancel at least 48 hours in advance, or are a no show the full amount of the tour will be charged to your credit card. Full amount prepaid and non-refundable under any circumstances unless captain cancels based on weather and/or safety issues in which case a full refund will be issued. Minors: you alone are responsible at all times for minors traveling with you. We do not assume any responsibility for them. We urge you to use an extra measure of care given we are on the water and also have a hot tub. Infants and Children are not permitted in the hot tub. Infants are not permitted in our canoes, or kayaks. Children using the canoes or kayaks with their parent's supervision must wear life jackets. By using our recreation facilities and courtesy equipment you do so at your own risk and are expressly waiving your right to hold us liable. Pets: Don't show up with a pet dog without first reading these pet policies AND clearing this with us otherwise you may be turned away without refund. ROOM SWITCHING Permitted – Call or email us if you don’t see any availability. Nightly and weekly bookings. 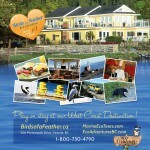 3 Private luxury condo suites + 2 budget rooms on the waterfront of a coastal lagoon wildlife preserve. We look back at downtown Victoria across the harbour. We will exceed your expectations. Experiences right here on our property will be the keepsakes you'll take home with you, and pull on you to return. Our quiet ocean lagoon property is one-of-a-kind. You simply won't find this at any other B&B, let alone a hotel. Book with us direct to be guaranteed our lowest rates.